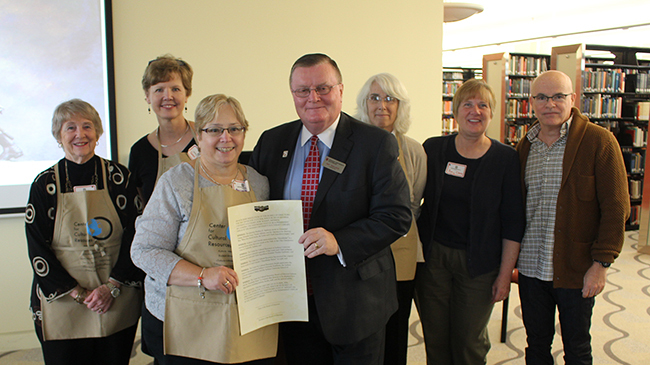 IU Southeast Chancellor Dr. Ray Wallace receives the dedication resolution from the Board of Directors of the Center for Cultural Resources, from left to right, Carolyn Diener, Dr. Susan Ridout, Mary Lee Foley, Sharon Zollman, Amy Clere, Dr. Bradford Griggs. (NEW ALBANY, Ind. )–Meriwether Lewis and William Clark shook hands on Sunday, Oct. 2 at IU Southeast. Or rather, re-enactors Jan Donaldson and Peyton “Bud” Clark (great-great-great grandson of the explorer), playing the roles of Lewis and Clark, performed the handshake. With that symbolic act, the two men honored the donation to IU Southeast of a statue commemorating the real handshake, which took place in October, 1803. The statue, already at home in a glass case in the IU Southeast library, is a 1/5-scale model of the life-size statue that stands at the entrance of the Falls of the Ohio State Park visitor’s center in Clarksville, Ind. It was near this spot that the two explorers met and launched their famed expedition. And it was the bronze model that launched the arduous fundraising effort that ultimately enabled the full-scale version to become a reality. Both bronzes are the work of the late Montana sculptor and history aficionado Carol Grende. The creation and placement of the two statues reflect the tireless work of the Indiana Lewis and Clark Commission over the past 15 years to see Clarksville, Ind. officially recognized as the starting point for the Corps of Discovery’s epic journey. The model has had a journey of its own. This summer, the statue’s owner, Phyllis Yeager, made it available to longtime collaborator and friend, Dr. Claudia Crump, co-founder of the IU Southeast Center for Cultural Resources (CCR), to ensure that it remain in the area. The CCR has worked closely with the Commission for many years, sharing its vision and supporting pedagogical initiatives that raise awareness of Lewis and Clark among the region’s social studies teachers and their students, such as the Lewis and Clark Expedition Summer Teacher Institutes, funded by the Commission. As a token of appreciation for the support it has received from the university, the library and the School of Education, the CCR resolved to donate the statue to IU Southeast for permanent display. Presenting the resolution to IU Southeast Chancellor Dr. Ray Wallace were members of the CCR board of directors, Carolyn Diener, CCR co-founder; Dr. Susan Ridout, professor of education; Mary Lee Foley chair; Sharon Zollman, teacher (retired); Amy Clere, teacher at Clarksville High School; Dr. Bradford Griggs, assistant professor of education. Adding words of recognition for the efforts of the CCR and Commission were Congressman and Chancellor’s Medallion recipient Ed Clere, Commission president Jim Keith and CCR co-founder Dr. Claudia Crump. Clark, Donaldson and Yeager provided emotional accounts of their involvement in the “family” of Lewis and Clark advocates, re-enactors and devotees, including the late Grende, who have shared an abiding bond across decades of immersion in this field of endeavor. Also in attendance was Elmer Hoehn, 100, of Jeffersonville. Over the course of his long and productive life, Hoehn has been an educator, attorney, Indiana State Representative, and member of President Lyndon Johnson’s White House staff. A former instructor at IU Southeast (1941-42) and recipient of a Chancellor’s Medallion (2003), Hoehn is a benefactor of the George Rogers Clark Cabin site and a founding member of the Indiana Lewis and Clark Commission. He has worked tirelessly to bring awareness to the significance of Clarksville to the Lewis and Clark story. “History lives in bronze,” Hoehn has said, referring to the role of public sculpture throughout history in shaping our common narratives. Certainly Hoehn’s words captured the mood of a network of community relationships built upon handshakes and a devotion to a common purpose. That network has been reflected in the many individuals and agencies working together to further the Commission’s aims. Those aims include inclusion of the region in the National Park Service’s Lewis and Clark Historic Trail, and the proposed naming of the new “East End” bridge after the explorers. The Lewis and Clark Handshake Bronze Dedication was part of the Lewis and Clark Indiana Bicentennial Celebration, a series of events, reenactments, displays and commemorations taking place in Clarksville and New Albany, Ind. Homepage photo: Peyton “Bud” Clark portrays his ancestor, Capt. William Clark.